Love it or hate it, we all appreciate why we should warm up before any exercise, especially something as blisteringly intense as a satisfying Street Fit® Hip Hop Workout®. Cooling down, on the other hand, might seem a little less important. Is there really any benefit to cooling down, or would it be better to squeeze a few more minutes of the fun stuff into your sessions? After looking at some of the research on the subject it appears that cooling down after exercise does have some benefits, although the picture is not as clear as you might think. A cool down is a period of reduced activity that follows a high intensity workout or pastime. It often consists of low intensity cv exercise (e.g. walking, jogging) plus additional stretches and, occasionally, relaxation techniques. Some of the widely accepted reasons for cooling down after exercise are actually hotly debated by those in white coats. For example, it is now believed that slowing down gradually may not help with the removal of lactic acid from the muscles and therefore may not speed recovery or reduce muscle soreness as commonly thought. Studies* have also shown that heart rate decreases just as rapidly during a cool down as it does when exercise is stopped abruptly. So what are the benefits of cooling down? When we engage in intense exercise, blood is pumped to the limbs in order to provide a ready supply of energy to the muscles. The action of the muscles also returns this blood to the heart. When we reduce our activity and stop moving our limbs, we also stop pumping the blood back to our heart. The effect of gravity then causes this blood to pool in our legs. The heart works as part of an intricate feedback mechanism, and responds to this reduction in blood return by decreasing output. Since the blood vessels in your limbs are still dilated, there is a drop in diastolic blood pressure and blood supply to the brain can be compromised, leading to nausea, dizziness and sometimes fainting. In addition, long-term blood pooling in the legs increases the risk of varicose veins. Although the removal of lactic acid from the muscles may not be promoted by a simple reduction in exercise, stretching the muscles does help with this. Therefore, by incorporating stretches you are not only increasing flexibility, you are helping your muscles to recover and they will feel less stiff in the morning. For class members, the cool down phase is a good time to reflect on what went well and what they need to work on between sessions. This is an ideal time for Instructors to ask questions, gain feedback and generally build rapport with their members. Some Instructors may consider introducing relaxation exercises and/or meditation to really bring the session to a serene end, although they should bear in mind that not all members will want this. Making big life changes is never a comfortable ride, so it isn’t surprising that we would sometimes prefer to cruise along in our personal comfort zones rather than stretch our limits. Fortunately, it is rarely necessary to make drastic upheavals to our lives in order to start moving towards the future we desire. Whether you already have experience in a dance, teaching or fitness-related industry; are a talented hobbyist or simply like the idea of starting off in a whole new direction, there is a way into the dance fitness industry for you. There are many professional backgrounds that are relevant to a career in dance fitness. If you have a performing arts background you will quickly be able to adapt your body awareness and choreography skills to a fitness workout, while personal trainers should have the physical co-ordination and stamina to master the rigours of dance. Dance fitness also requires an arsenal of personal skills: the ability to control a class of different personalities; the patience to work with those of limited ability; the creativity to come up with new and stimulating routines and the organisational skills to keep your business running efficiently. Therefore teachers, artists and even accountants should find something in their professions that will stand them in good stead for a dance fitness career. If you already work in the industry, you are in a prime position to make valuable contacts en route to starting out on your own two feet. As long as you’re careful not to allow a conflict of interests to undermine your employed role, you should be able to do some valuable market research simply by talking to the people you come into contact with on a daily basis. Find out what classes they do, what they like and dislike about them and what kind of classes would suit them best. You might also be able to get an idea of reasonable venue prices and good quality suppliers. There is no reason why a passionate dance hobbyist can’t reach the lifestyle potential of a seasoned pro. The younger you are, the easier it will probably be for you to adjust your life to incorporate more of what you love to do. That doesn’t mean that it’s ever too late to become a dance fitness instructor, it just often requires more planning and negotiation (e.g. if you have family commitments to work around). It is important to understand that teaching dance fitness professionally requires the development of a range of technical, business and personal skills. For example, you will need to learn about the anatomy of the body, how to avoid injury by following good practise and skills in effectively communicating to a diverse group of people. While the Street Fit® Instructors’ Course will give you the foundational skills and certification you need, it is your own determination and willingness to develop that will ultimately bring you success. Even those who have marvelled at the skills of a street dance troupe but never visited a street dance class could end up making a living from dance fitness. Street Fit® Instructors’ Courses are affordable and open to anyone, although we do recommend you take part in a few preliminary classes before taking on our ultimate Hip Hop Workout®. If you’re lucky, there may be a Street Fit® Instructor teaching classes in a town or city near you! There’s a lot of confusion in the dance fitness industry at the moment and it’s not surprising. As more and more companies seize the opportunity to jump on the dance fitness bandwagon, the trend has been to mix and match anything and everything in an attempt to create something truly unique. While that can be a good thing and lead to real innovation, sometimes it is just an excuse to throw a few ‘cookie-cutter’ dance steps to music and hey presto – a new dance craze. Unfortunately, that sort of approach doesn’t create dancers it creates clones, and that’s not what Street Fit® is about! Street Fit®, the Hip Hop Workout®, is different: we actually teach you to dance and while this may stretch you at first, like all worthwhile achievements should, persevere and you will find yourself attaining new heights of satisfaction. We welcome those who have grown bored of trotting out the same old routines and want to inject some new life into their dancing. If you have previous training in fitness and/or other dance formats, we will help you utilize those skills and take them to a higher level. Although the majority of people attending the Street Fit® Instructors Course will pass with flying colours, we can’t match the 99 per cent pass rates that some other dance companies profess to have. We’re pleased with that because that shows us we’re providing something of real value – not a carbon copy of what’s already out there. If you expect to just turn up, go through the motions and get a certificate you will be sadly disappointed; there are other courses out there for you. As we have been trying to promote, Street Fit® is as much about the right attitude as it is about dance ability. The right blend of creativity, self-expression and determination enables Street Fit® instructors to master the initial choreography before moving on to create their own. On the other hand, even the simplest choreography will remain lifeless if it’s fed to you on a plate, requiring no effort on your part. The rewards of your time, effort and initial investment will become clear as you begin to realise that Street Fit® instructors are in a class of their own. Therefore, treat the Street Fit® instructors’ course as a launch platform rather than a prescription and prepare to soar to new heights of personal success. 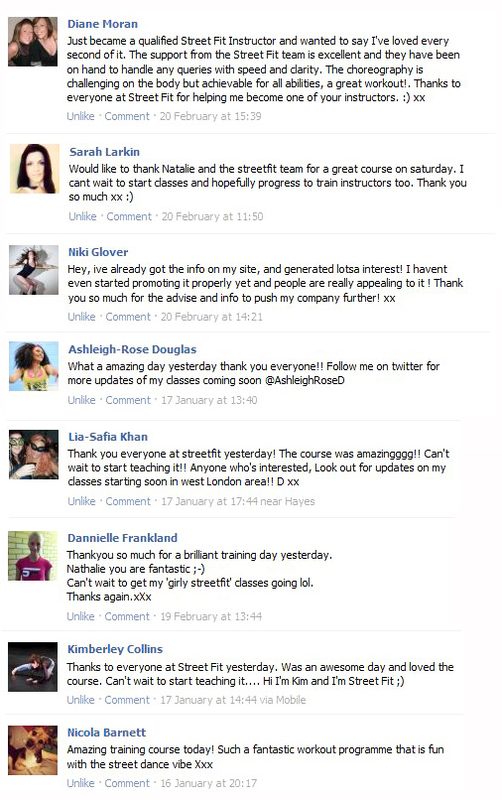 With over 300 UK based instructors and over 20,000 facebook fans it is clear to see that Street Fit is becoming popular and fast, you could benefit from becoming one of our Instructors so what are you waiting for? Join the Street Fit Family today! Contact us today on 0800 689 9909 or visit our become an instructor page for lastest dates and locations of courses near you. As a dance fitness instructor, your body is your livelihood. To cope with the physical and mental demands of high-level dance fitness performance, you need to ensure you provide your body with adequate quantities of nutritionally-balanced food. This post explains what this means for the average, healthy dance instructor. Your nutritional requirements can be divided into six types of nutrient: carbohydrate (55-65%), fat (20-30%), protein (12-15%), vitamins, minerals and water. The reason you need so much carbohydrate (up to 65% for high-intensity work), is due to the way energy is utilised in the body. For energy production, our muscles make use of a substance called glycogen. Glycogen is built up from glucose (sugar) in the blood, and stored mainly in the liver and muscles. Clearly, there needs to be an adequate, steady supply of glucose in the blood for this process to take place. Complex carbohydrates (which need to be broken down into sugars) are preferable to consuming sugar directly for two main reasons: complex carbohydrates also contain additional nutrients and they provide a steady supply of glucose, rather than the sudden surge that sugars do. Complex carbohydrates are found in foods such as cereal, rice, pasta and bread. Carbohydrates should be consumed one to two hours before exercise but can be topped up during long performances by eating cereal bars or drinking sports drinks containing 6-8% carbohydrate content. Carbohydrates are best replenished within the two hours immediately following exercise, since this is when glycogen replacement happens fastest. Despite its reputation, fat plays a crucial role in the body and you need about 1.2g/kg of body weight (although no more than 10% should be saturated fats). Adipose tissue (stored fat) is the primary reservoir of energy in the body and packs a whopping 9 calories* per gram. Once faster-burning glucose is exhausted, your muscles will turn to fat for fuel – this is good news if we carry a bit extra! Fat also forms the structure of cell membranes, cushions the nerves and organs, and enables the fat-soluble vitamins (A,D,E and K) to be absorbed. The process of exercising causes wear and tear to the muscle fibres, which require replacing. For this to happen, there must be adequate supplies of protein in the diet (1.4 to 1.6 g/kg of body weight). Chicken and turkey are great sources of lean protein, although vegetarians can obtain protein from other sources, including tofu, seitan, beans and rice. Protein is also necessary for building enzymes, specific types of protein that carry out a variety of roles in chemical processes throughout the body. Be cautious of commercial ‘protein powders’: many of these are no more effective than dry milk powder and considerably more expensive. Vitamins can be either water soluble (the B vitamins and vitamin C), or fat-soluble (A,D,E and K). They provide a variety of functions that are vital to the functioning of a healthy body. The B vitamins thiamine, riboflavin, niacin and B6 are used in energy production, while folic acid and vitamin B12 are needed in red blood cell production (the blood cells that carry the oxygen to your musces). Minerals are divided into macronutrients (needed in quantities in excess of 100mg a day) and micronutrients. Macronutrients include Calcium, Phosphorus and Magnesium. Calcium and Phosphorus are necessary for healthy bones, while Magnesium is important in a variety of processes from enzyme regulation to DNA building and muscle contraction. Micronutrients include Iron and Zinc, which are both necessary for red blood cell production. Heme iron, from red meat, is easier to absorb, although non-heme iron, like that found in whole grains, can be absorbed more easily in the presence of vitamin C.
If you choose to supplement your diet with added vitamins and minerals, opt for those that do not exceed your daily recommended intake. An imbalance of vitamins and minerals can affect absorption and it is possible to overdose on some nutrients. Dietary control of vitamins and minerals is always better than taking tablets. During a workout, you will be losing about two litres of water an hour via perspiration. Dehydration will impair your performance and slow your mind – not ideal when you have new choreography to learn! Aim to drink about 250ml water every fifteen minutes to keep fluid levels high. Don’t wait until you feel thirsty before taking in water: you will already be dehydrated by then. Don’t substitute water for fizzy drinks: these actually leach water from the system, making you even more thirsty. *Kcals and calories are used interchangeably in this article. Both are shortened forms of Kilocalories, the standard unit of stored energy. Disclaimer: Although we have taken care to provide accurate information, the information above does not constitute professional dietary advice. Consult with your doctor or a dietician for more information.